One of the more common calls to an animal removal specialist is Kentucky bird control. Don’t let Birds start building nests in your attic. Birds in your home is a problem that should be dealt with quickly. There are a number of different ways of attempting bird removal in Kentucky. A bird control expert can help you with the best method or getting birds out of your home. We can help you with bird removal and relocation. We can also help you with bird exclusion, which will prevent birds from being able to gain access to your home again. Bird exclusion is one of the best ways of preventing any future bird problems in your home or business. There are a number of bird problems in Kentucky that can be created as birds build nests in your home. Birds can transmit a number of diseases to people and animal through their droppings. Birds can also carry lice and mites. Once removed from your home, it is best to have the area disinfected to ensure that there are no lingering potential health risks. Pigeons are a species of bird that is common in both city and rural environments. Kentucky Pigeon control can help you to remove this bird from your home or business. Pigeons are a disease carrying pest animal. There are a number of diseases that are attributable to pigeons. It is best to remove them as soon as you can. 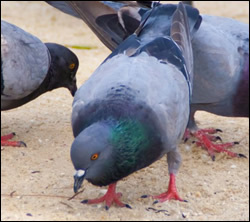 Left untreated accumulation of pigeon droppings can cause damage to your home. Droppings can cause a roof to begin to rot; which in turn can cause leaks in your home. You should not attempt to clean up these pigeon droppings on your own as they are known to cause Histoplasmosis.